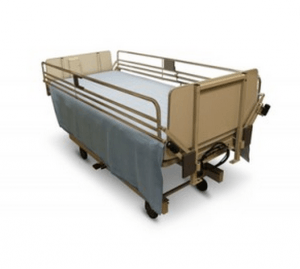 Amongst a myriad of issues faced by patients in nursing homes, one that requires immediate and serious concern is the entrapment of patients in the bed rails. Bed rail entrapment refers to patients being trapped in the rails of their bed, which causes obstruction in their movement and makes them unable to get out of their bed. Being stuck in the bed rails for hours leads to suffocation and immobility, which eventually results in the death of the patient. This is a commonly experienced problem in most nursing homes and is making people unsure of their decision to send their loved ones to nursing homes. Several cases of patients being severely locked in the bed rails in nursing homes have been reported in the past. These include that of a patient who had his head and torso trapped in the head side rail and foot and head rails respectively and his lower body hanging down towards the floor. This patient died a little while after experiencing this accident. Another case is of an eighty-year-old woman whose head was caught between the mattress of her bed and the head side rail, her arm was locked in the rail on the foot side; she too passed away due to this shocking episode. In one other case, an old man was entrapped between the bars of the side rail of his bed and received serious injuries on his head. Nursing home tragedies have become a very common cause of death for severely ill or crippled patients. This issue is so much serious that residents who are otherwise recovering steadily, suffer severe injuries and emotional stress at the hands of caregivers who our society trusts with their loved ones. Of all kinds of nursing home tragedies, neglect tops the list with 58.5% share. No doubt, a neglectful staff at an elderly care home can be the cause of a painful and regretful death because most residents admitted to such facilities do not have any control over their movements and actions, thereby being completely dependent on their caregivers. It seems that for every episode involving of complex medical care that goes wrong during an admission to a nursing home or hospital, there are at least a handful of ‘adverse events’ that result simply from the fact that someone at the facility wasn’t doing his or her job properly. In reviewing hundreds of medical malpractice cases, one of the most difficult parts of the evaluation process is explaining to families how an adverse outcome doesn’t necessary equate to a viable case in a legal sense. As a party initiating a medical negligence lawsuit, the individual or family bringing the case has the burden of proving their case and must establish not that there was just a bad outcome—but most crucially, the poor outcome existed because of a ‘deviation in the standard of care’ on the part of the treating physician or staff— a much more difficult hurdle to cross than simply demonstrating that someone was injured. 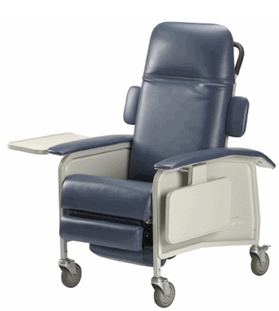 One of the fixtures of nursing homes and other long-term care facilities is the ‘hospital’ bed. Many of us have become so accustomed seeing this piece of medical equipment in patient rooms that we hardly give much thought to the fact that these devices are indeed medical equipment– and when not used properly, there’s an opportunity for patient injury or even death. A patient dying due to problems with his bed? As shocking as it may initially sound, patients are routinely injured or killed when they become entrapped in the bed that they were given by a facility. A recent New York Times article, “Consumer Agency Finds Most Adult Bedrail Deaths Are Among Those 60 and Older” discussed how the Consumer Product Safety Commission (CPSC) released a report chronicling bedrail safety from 2003 through 2011. All told, data from death certificates and emergency room visits suggests that 155 deaths and nearly 37,000 injuries were directly attributable to complications with bedrails on hospital beds. Use Of Restraints Amongst Nursing Home Patients Has Been Reduced More Than 50% Over The Last Decade. Is It Enough? When you consider forms of cruel treatment, maybe you consider beds of nails or solitary confinement? However, another form of cruel treatment— the use of restraints, is commonly used with innocent nursing home patients. At some facilities, patient restraints are a commonly used tool used by facilities in lieu of providing actual hands-on patient care by facility staff. In the past, nursing homes used physical restraints such as: bed rails, lap belts, vests, wrist ties and special chairs to assist them in literally controlling their patients. In addition to de-humanizing patients, the use of restraints was attributed to rapid physical deterioration and increased rates of patient injury. In response the the poor publicity and family outrage, many skilled nursing facilities have made great efforts to reduce use of restraints. The reduction in restraint usage was recently discussed in an article by Megan Brooks on Medscape. To many, the use of bed rails on a hospital bed provides an added level of safety to prevent falls for patients who may be in a weakened physical state. While use the of bed rails may be appropriate in certain situations, research tells us that bed rails are still significantly overused and can endanger patients by allowing them to become entrapped in a gaps created between the rail and the side of the mattress. The entrapment risk can quickly kill a patient within minutes. The New York Times recently reported on potential dangers associated with the unnecessary use of bed rails in the nursing home setting. The Time article cites Steven Miles, a geriatrician and bioethicist at the University of Minnesota who has studied the usage of bed rails amongst the elderly. “Rails decrease your risk of falling by 10 to 15 percent, but they increase the risk of injury by about 20 percent because they change the geometry of the fall,” Miles notes. More than 20 years after Congress passed the the 1987 nursing home regulatory law (OBRA) which granted nursing home residents the “right to be free” restraints for discipline or staff convenience–much progress needs to be made to accomplish that goal. Once widely thought to prevent nursing home residents from falling and wandering off, the use of physical restraints is not nearly as common in most nursing homes. According to a recent USA Today article, the use of physical restraints amongst nursing home residents has been drastically reduced over the past 20 years. Medicare statistics verify 21.1% of residents were restrained on a daily basis in 1991 compared to just 5.5% in 2007, the most recent full-year set of statistics available. ‘Restraints’ are generally known as any device used to prevent a resident from wandering or falling, or residents who may be easily agitated (due to uncontrolled pain). The most commonly used restraints used in the nursing home setting are bed rails and geri-chairs. However, nursing homes have been be known to use make-shift ‘tie downs’ thereby securing residents to beds, benches, dining chairs and even toilets. Bed rails are a common source of injury and death amongst the nursing home population. In efforts to minimize risk, the FDA has established different ‘zones’ of the bed to determine potential for getting caught in the rails. In order to fully appreciate how bed rail gaps are measured, I found this video. Despite long standing warnings from the FDA, bed rail entrapment continues to be a real threat to the safety of people in nursing homes, hospitals, and long-term care facilities. After FDA warnings were issued on rail safety, many manufacturers began production of safer designs. 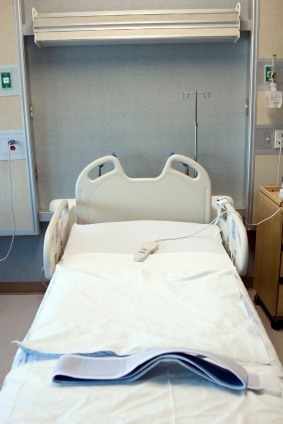 Although the warnings have been issued, the FDA has not imposed any bed rail recalls on beds known to commonly be the source of injury and death. The lack of formal action by the FDA will likely result in future incidents involving: injury, fractured bones, strangulation, asphyxiation and death. The safer rail designs have yet to make there way to the places they are needed. At many facilities there is little incentive to discard a usable bed, despite the fact that the design may be antiquated and unsafe. Further, many beds are rented from medical supply companies that have a substantial inventory of beds with older designs. Rental beds are typically the least safe beds in use today. 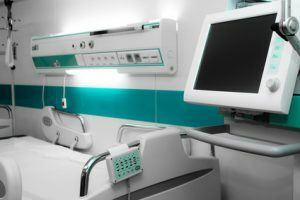 Many rental companies pay little attention to the combination of parts used when distributing beds for home and facility use. It is common to see a mattress designed for one bed used with the frame from a different manufacturer. The combination of mattresses and bed frames results in unintended ‘gaps’ in which a person can easily get caught. 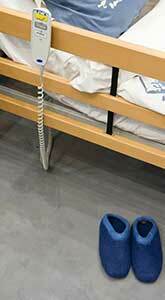 A recent NPR radio program discusses bed rail safety in nursing homes. 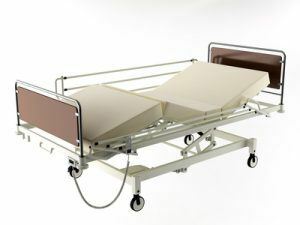 The increased demand for hospital beds in nursing homes, hospitals, hospice programs, and in home use has resulted in a shortage of certain bed parts. For example, mattresses may be improperly sized to the type of beds. Using improperly sized mattresses may result in gaps between the end of the mattress and the bed rails. The gaps allow patients to get wedges between the mattress and rail. The entrapment may result in suffocation, falls, lacerations or even death.